You’re planning to renovate your home or perhaps build a new one. This is an exciting endeavor and choosing the right design build team is the single most important decision you will make. Buildings, like relationships, start with a solid foundation. At George Davis, Inc. integrity, thoughtful planning, realistic budgets, and a superior design build experience are the foundations of the projects we do. So are great relationships – from our team of designers and carpenters, to our trade partners and local vendors – you will be pleased to discover that you will actually enjoy your design build experience with us. Just ask our former clients who continue to use and recommend us. You can expect professionalism and friendliness from your first call to us. We will answer your questions and may ask a few. What kind of work do you desire? Your time frame? Your budget? An appointment may then be scheduled to meet with George or one of our award-winning designers. The scope of your project will determine whether we enter into a Design Agreement or whether we simply provide a Construction Proposal. If you already have very well developed construction plans and require little assistance with project pre-planning and selections, we will usually provide a Construction Proposal. Generating ideas and collaborating with you to develop a set of plans that meets the objectives of the project. Identifying all that is to be done and writing a detailed set of specifications for your project. Exploring the various permitting requirements and identifying any potential hurdles so that when that time comes, there are no surprises. Monitoring and sharing the costs of the project as it moves through the Design Phase so that when we present the final quote it is within your expectations. Again, no surprises. Once we’ve complete the Design Phase and you’ve made the decision to continue into construction, the fun continues. The next step is our Pre-Construction Phase, where we complete the plans to be permit and construction ready, obtain the permits, and develop a detailed schedule for the Construction Phase. You’ll also be working with our design team to fine-tune your vision with regard to final selections regarding colors, tiles, fixtures, and flooring that reflect your taste and style with the design aesthetic, full support, and guidance of our incredible team. After all the designing, permitting and planning of your project is complete, it’s time to get building. You will receive a production schedule for your project and will be informed at all phases of construction with progress updates and photos. If you live around the corner, across the state, or halfway around the world, you will find peace of mind knowing that your project is being built according to the plan, by a team committed to the vision, and with an integrity that is the hallmark of George Davis, Inc. Enjoy! Your project is complete and your experience with George Davis, Inc. has been exceptional. Now it is time to enjoy the new and beautiful space you’ve created with our help. 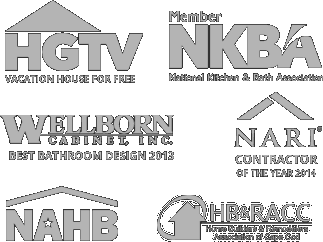 When you’re ready for another renovation or addition, you’ll know who to call!